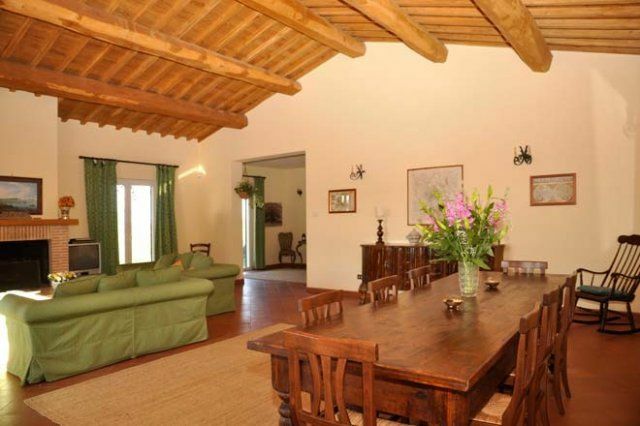 One of only 5 independent villas with their own private pools situated on a wine and oil producing estate only 2.5 miles from the quaint town of Magliano Sabina - largely untouched by mass tourism. 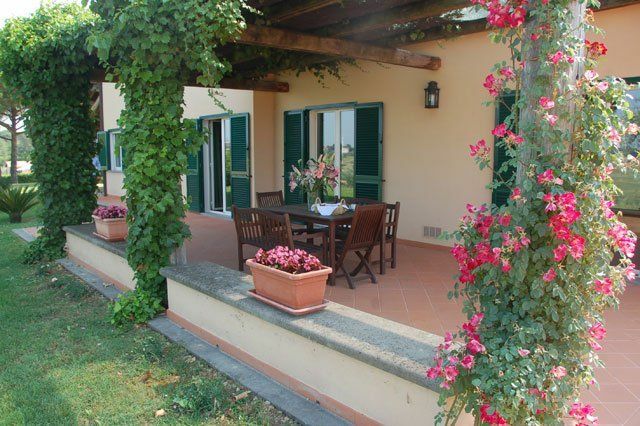 Villa Laurentia is surrounded by vast expanses of vines and olive trees and offers lovely views of the surrounding countryside. 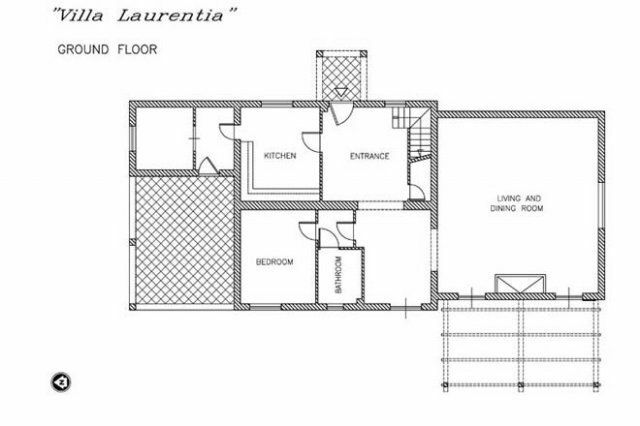 The property benefits form a large, lawned garden with covered gazebo perfect for dining ‘al fresco’ and a BBQ area. The spacious living areas are tastefully furnished with large floor to ceiling windows which open on to the private pool - situated just a few meters from the property. 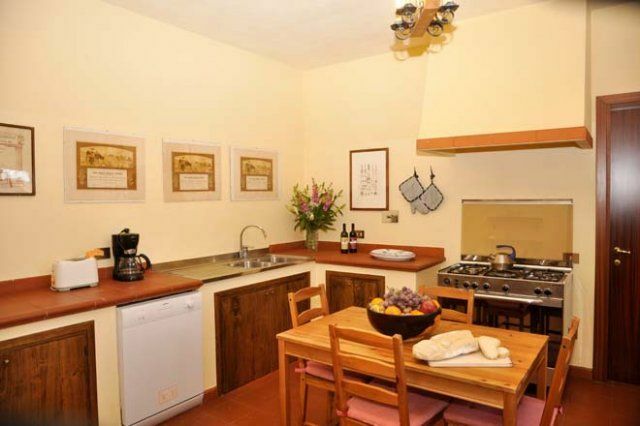 Fully wheelchair accessible and fitted to host guests with disabilities. Wi-fi, dishwasher. 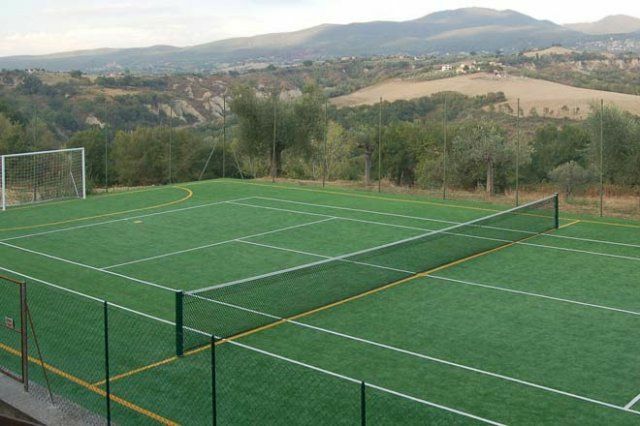 Shared tennis court and five-a-side football with artificial turf and a table tennis. Rackets and balls are also supplied. Large living room with fireplace, Tv, Satellite, Dvd and Cd player, telephone, free wireless internet broadband, dining area, large sun windows; fully-fitted kitchen with dishwasher, freezer, fridge, grill, oven and washing machine; twin bedroom with private bathroom with shower (wheelchair accessible). 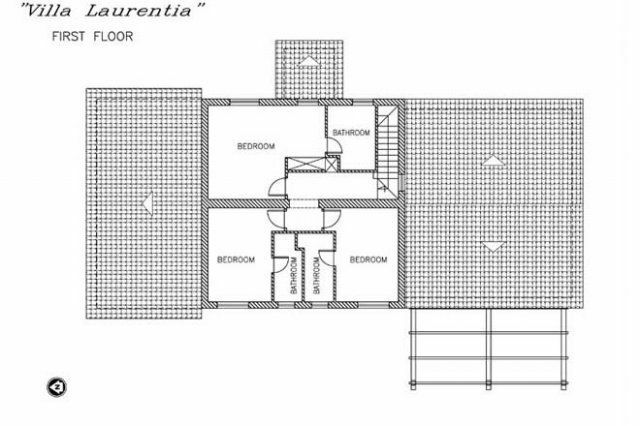 1 double bedroom with private bathroom with bath; 1 twin bedroom with private bathroom with shower; 1 twin bedroom with private bathroom with bath. 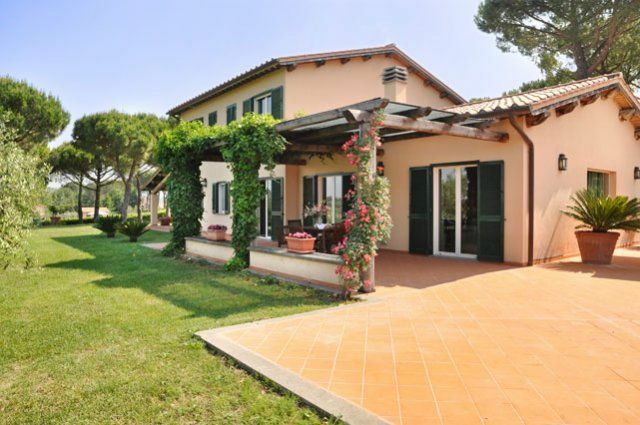 The villa has a huge private garden with a pergola and a barbeque area. The patio, with wooden table and chairs seating 8 people, is perfect for al fresco dining. 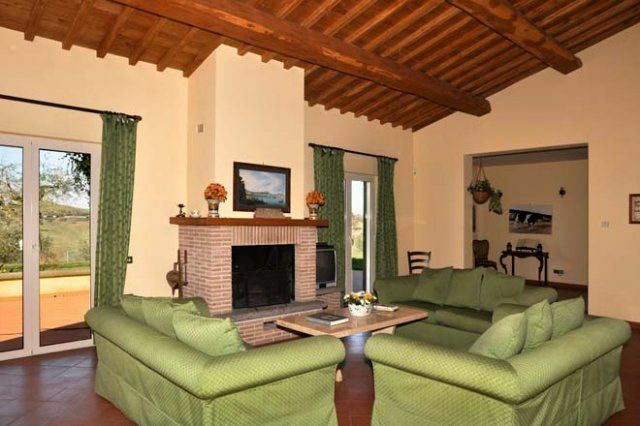 The pool area is completely private and is situated at 30 meters from the villa. 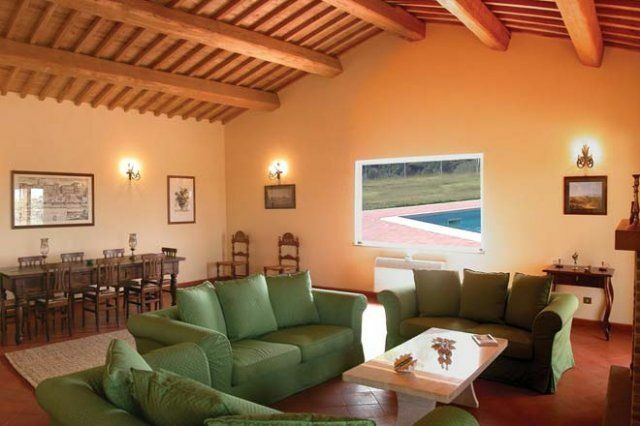 The pool (12 x 5 mt; 1,20-1,40 mt/depth) is immersed in its own garden with views of the estate. The surround is paved in terracotta where the umbrellas, deckchairs and armchairs are situated. Please check on our availabilty calendar for final confirmation. 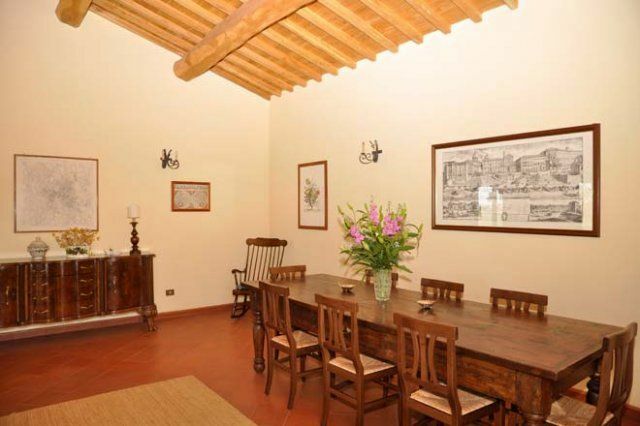 The Estate is located 2.5 miles from the quaint town of Magliano Sabina, in the enchanting Sabina area. 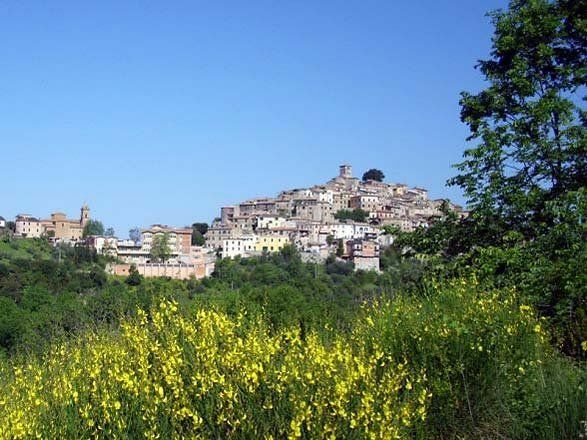 This small hilltop town has Roman roots (Fundus Malianus) and was founded by an aristocratic Roman family called Manlia. Medieval glory followed due to the town's diocesan connection to the still-intact Abbey at Farfa and hence came papal power and patronage. 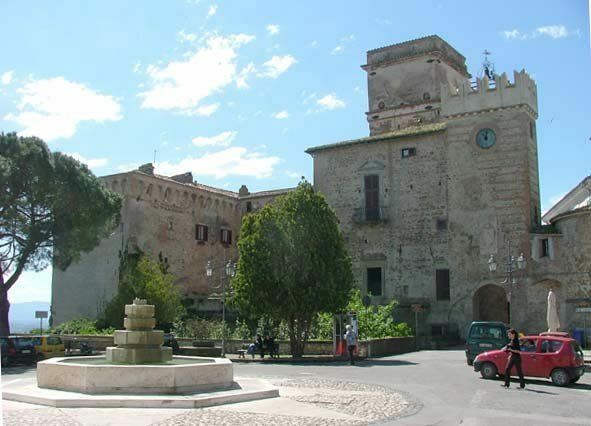 The town's museum features many Etruscan and Roman remains, whilst a stroll through the narrow and windy streets will take you back to the medieval Italian life.Of particular note is the 15th century cathedral, rebuilt in the 18th century, the Bishop's Palace, the Town Hall and the 18th century church Santa Maria delle Grazie which holds a Roman crypt with 15th century frescoes. 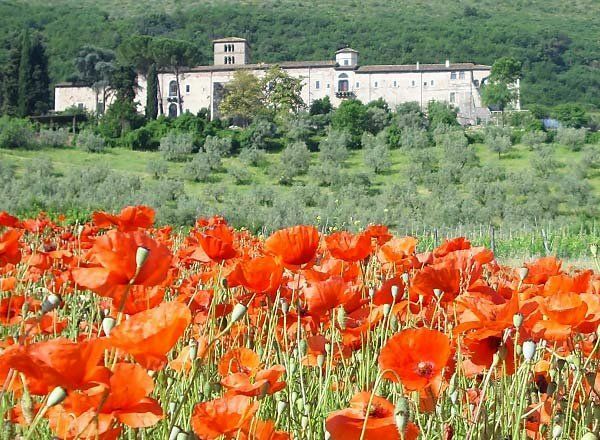 Thirty miles north-east of Rome and untouched by mass tourism, Sabina is still authentic and unspoilt. 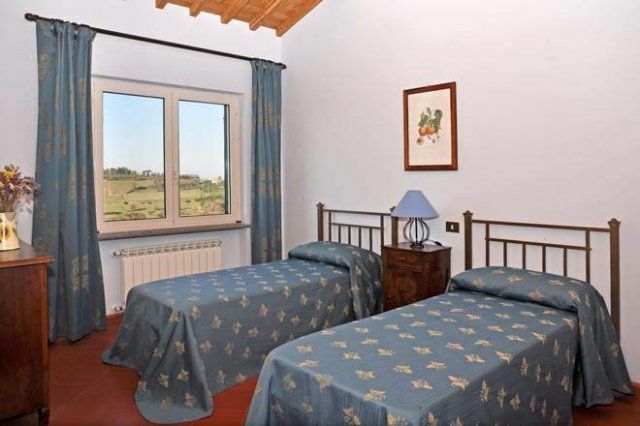 Its landscape of gentle hills where agriculture is in perfect harmony with the surrounding nature, is scattered with Roman villas, Medieval castles, churches and abbeys and many remains of Italy's historic, cultural, architectonic and artistic past. 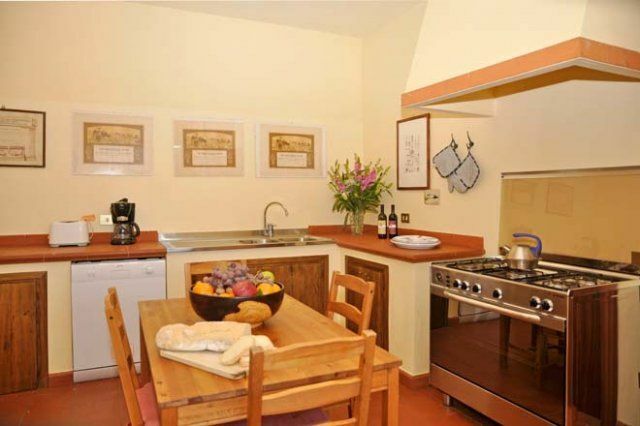 Exploring the area is very easy using one of our self catering villas as starting point. 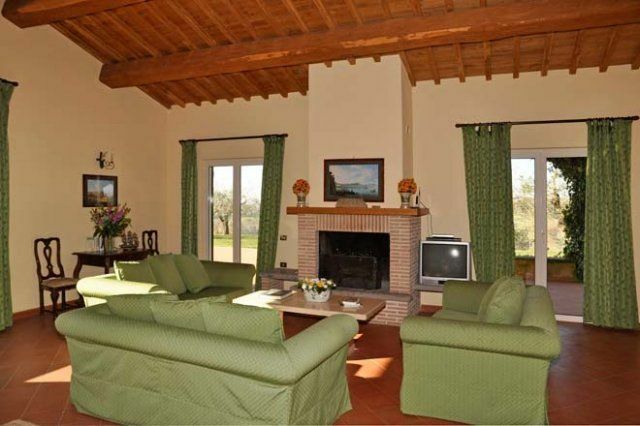 The olive trees are integral part Sabine landscape since the times of ancient Rome. 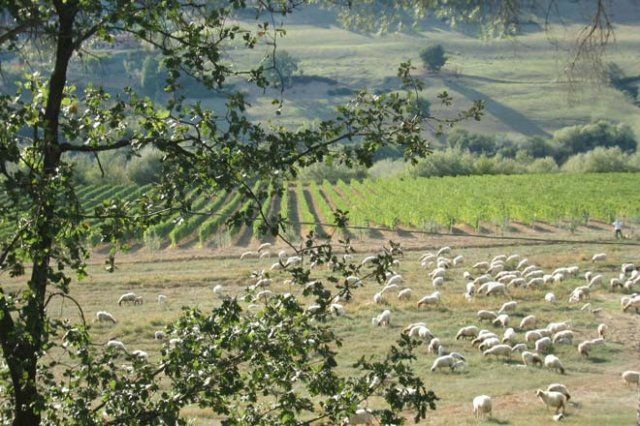 Extra virgin olive oil, with its European DOP recognition, is the main ingredient in the local cuisine, made of genuine and country style dishes prepared with the area’s agricultural products. There's no better place for Italian food lovers. Riding schools, golf courses, natural bolted cliffs for free climbing, along with Mount Terminillo, ski resorts and several naturalistic itineraries, are some of the possibilities for sports lovers in an uncontaminated natural environment. The area is alive in winter and summer for the holiday of your choice. 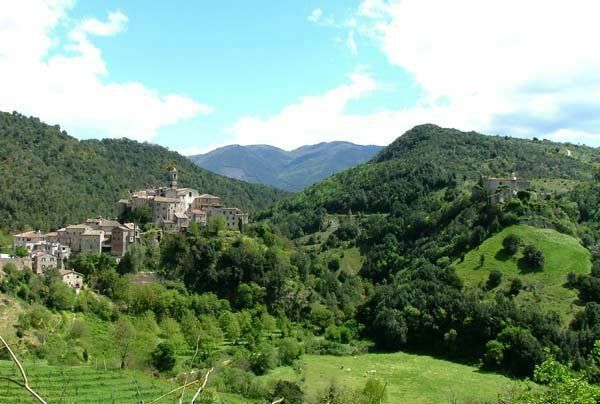 The Reatine Valley, with its Franciscan sanctuaries, Farfa Abbey, for centuries a witness to the power of the Roman Church, the Romanesque churches of Vescovio and Santa Vittoria, the archaeological sites and ancient Roman town of Trebula Mutuesca and Forum Novum, as well as the national parks and the capital city Rieti, are among the many attractions in Sabina. Along pleasant country roads, you can easily reach breathtaking places still unknown by tourists. 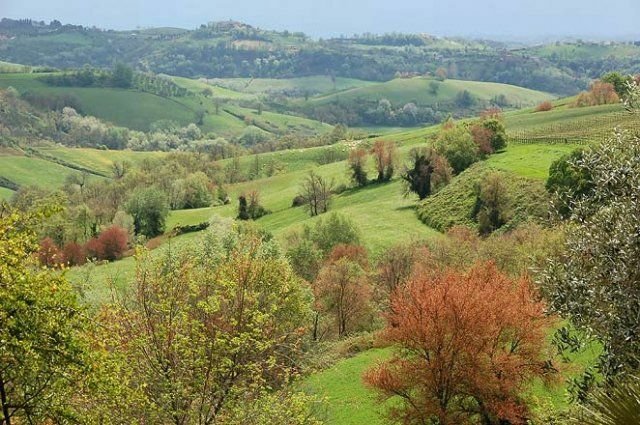 The motorway A1, instead, gives you an easy and quick access to some of the most important artistic sights of central Italy, such as Viterbo, Orvieto, Spoleto, Perugia but also Arezzo, Florence and Siena. 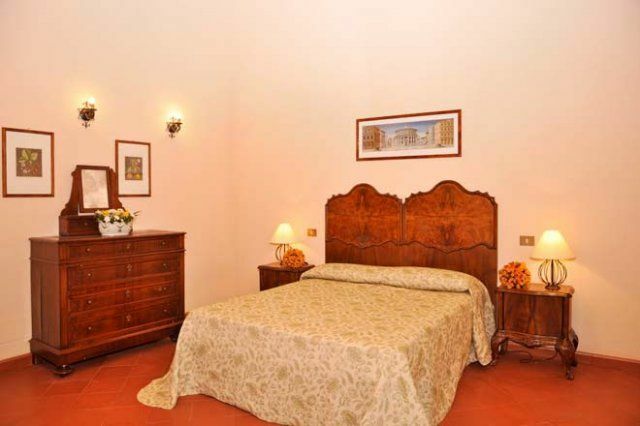 Rome itself is just a few miles away, and very easy accessible, in less then one hour, by train or car.